I just love my neighbor's tree! The petals fall into our yard, so I consider it mine as well! ;) Where I live, we had an extremely mild winter. It only snowed a handful of times and never got very cold. It was quite unusual. Spring has rolled in pretty early as well. I appreciate the beauty in each season but every year is different in my hometown. Some years the seasons are divided quite equally and other years it seems as though we didn't get much of one or another. It can start snowing in October and not end until April or could be like this year and hardly snow at all. 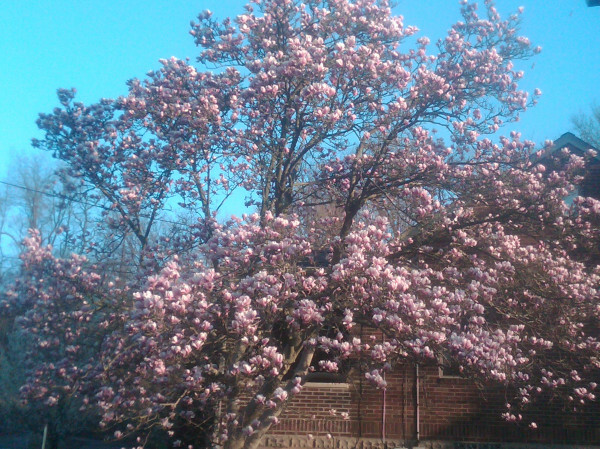 Spring is a season that is usually quite fleeting in Pittsburgh. Winter will seem to go on forever and before you know it, it's summer. But it looks like 2012 will be unique and give me a chance to enjoy some of my favorite types of weather. My ideal temperature is around 70 degrees, blue skies and a nice breeze. Today is that kind of day.